BREAKING BENJAMIN's 2015 gold-certified effort, "Dark Before Dawn", debuted at number one on the Billboard 200 chart. A commercial success, to say the least, the release was built upon the back of radio rock chart-topping tracks like "Failure", 2015's most played Active Rock track, and "Angels Fall". Hot on the heels of the chart-busting release, the hard rock juggernauts have returned to the spotlight with its sixth-studio album: "Ember". Considering songs like the debut single "Red Cold River", the potential for "Ember" to reach a comparable level of success as its predecessor is significant. Benjamin Burnley and his cohorts—the singer/guitarist is joined by bassist Aaron Bruch, drummer Shaun Foist, and guitarists Jasen Rauch and Keith Wallen—have returned with a dozen tracks that remain true to the band's established sound and approach that is hard hitting and heavy without forsaking the benefits of hooks and melody. "Red Cold River" perfectly exemplifies this marriage. The bottom heaviness of "Feed the Wolf", meanwhile, leverages the group's inclination for down-tuned heftiness. As a whole, "Ember" represents some of BREAKING BENJAMIN's most seemingly angry material in years. Ten proper tracks are bookended by a quick, forgettable intro, "Lyra", and an equally brief but enjoyable ambient outro, "Vega". This finale is driven by a simple evocative synth movement atop a solid rhythmic backbone reminiscent of classic NINE INCH NAILS. BREAKING BENJAMIN has more or less stayed the course with its hard rock that can also, with varying degrees of accuracy, be described as alternative metal, post-grunge and post-nu-metal. Yet the unit has perhaps never followed a release with as many similarities as that which came immediately prior. It's more than a simple carbon copy. It's essentially a continuation of a refined formula. Unfortunately, however, it's just too much of the same. The band doesn't seem to be doing anything to significantly challenge itself or its listeners. Granted, while an "if it ain't broke, don't fix it" ethos is one that many bands need to consider, "Ember" is just too safe and predictable. Midway into the album, songs like "The Dark of You" and "Down" are apparently designed as a reflection of melancholy, which the band sufficiently conveys; however, the expressions simply drag. "Down", in fact, unintentionally sounds like a poor attempt at self-parody. 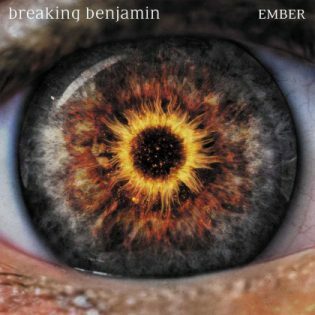 Shortly after said shortcomings, though, BREAKING BENJAMIN gets back on track—keeping in mind that "Ember" started off with songs like the crunching opener "Feed the Wolf" followed by the dynamic journey encapsulated in the single "Red Cold River". By the time we reach the eighth song, "Torn in Two", BREAKING BENJAMIN move away from the introspective numbers and return to doing what it does best. The unit's star shines brightest when the songs drive forth with fist-clenching heavy riffs intertwined with soaring, melodic vocals lines. A couple of tracks later, "Save Yourself" takes the heaviness up a notch with a head-nodding riff that is just as aggressive as it is catchy. Burnley has expressed that the album explores the band's heavy and melodic dichotomy to the "furthest degree", which is true, but it's clear that the band's greatest prowess is when the two occasional disparate traits converge with a greater focus upon the hard-hitting element. "Ember" ultimately proves to be an extension to "Dark Before Dawn" rather than a progression, and, again, this would have been okay if the material was exceptionally strong. "Ember" isn't bad, but it isn't exactly one of the band's best efforts. There are a handful of bangers, but longtime fans are likely to hit the skip button to get to some of them.